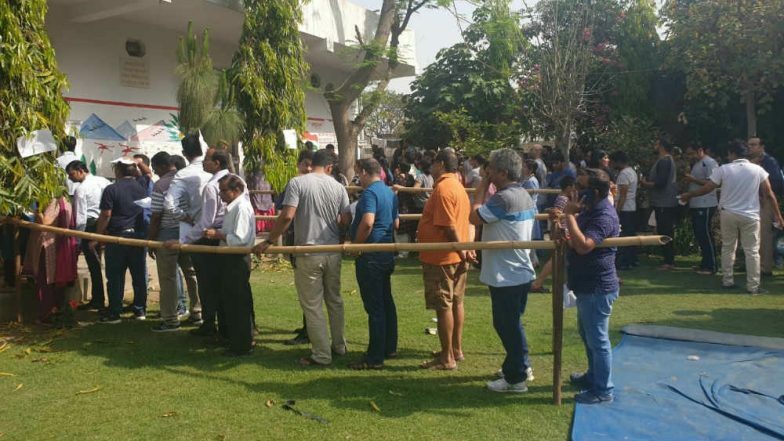 Noida, April 11: In what could be a violation of model code of conduct, unidentified people distributed NaMo food outside a polling station in Noida, Uttar Pradesh where first phase voting for the Lok Sabha election was underway. NaMo is a common abbreviation used for Prime Minister Narendra Modi. However, the food packets didn't feature picture of PM Modi or symbol of the Bharatiya Janata Party (BJP). According to reports, NaMo food packets were distributed outside a polling booth in Noida Sector 15A, reports said. The distribution happened minute before the arrival of Union Minister Dr Mahesh Sharma who is contesting from the Gautam Buddh Nagar Lok Sabha seat. Under the model code of conduct, no campaigning is allowed 48 hours prior to or during polling. It was not clear whether any complaint was lodged against the distribution of NaMo food. Andhra Pradesh Lok Sabha, Assembly Elections 2019: EVM Malfunctions Mar Polling, Jana Sena Candidate Arrested For Smashing Voting Machine. In Gautam Buddh Nagar parliamentary constituency, apart from BJP's Mahesh Sharma, Satveer Nagar of the BSP, Dr Arvind Singh of the Congress party, and 10 other candidates are in the fray. The Lok Sabha seat has 22,97,478 voters and consists of five assembly segments – Noida, Dadri, Jewar in Gautam Budh Nagar and Sikandrabad and Khurja in Buldanshahr. Uttar Pradesh Lok Sabha Elections 2019: Dhol And Flower Petals Welcome Voters at Polling Booth in Baghpat. Earlier today, voting began for eight key Lok Sabha seats in western Uttar Pradesh in the first phase of the seven-phased elections. The parliamentary seats where voting was underway are Saharanpur, Kairana, Muzaffarnagar, Bijnor, Meerut, Baghpat, Ghaziabad and Gautam Buddha Nagar. The results of Lok Sabha elections 2019 will be declared on May 23.